Young readers may not realize that there was a time when the America’s Cup actually was a “friendly competition between nations” in which every member of a yacht’s crew was actually a citizen of the nation represented by that yacht. Furthermore, before the turn of the 20th Century two of these “All American” crews hailed from an island in Maine’s Penobscot Bay. In his first book, author Mark J. Gabrielson tells the story of how, in 1895 (during the “Seawanhaka Rule” era of Cup racing), the defending New York Yacht Club sent emissaries to Deer Isle to recruit the best sailors in the country. Nearly 40 of these men, under skipper Hank Haff, sailed the 123-foot Herreshoff sloop Defender to victory over the British challenger Valkyrie III in a very controversial series in the waters off Sandy Hook, NJ. The dramatic illustration on this book’s cover, “The Foul” by marine artist Russ Kramer of Mystic, CT, depicts a moment on September 10, 1895 when Valkyrie III bore down at the start of the second race, an instant before her boom snagged Defender’s topmast shroud. When a surprise challenge was issued four years later by tea magnate Sir Thomas Lipton and the Royal Ulster Yacht Club, the NYYC once again recruited Deer Isle’s fisherman sailors. Columbia, a 131-foot sloop designed and built by Herreshoff and helmed by Charlie Barr, defeated Lipton’s Shamrock in three straight races. Undefeated in two Cup series, Deer Isle’s humble heroes had secured a unique place in the event’s history. Mark J. Gabrielson is a U.S. Coast Guard-licensed master and a trustee of the Marion to Bermuda Cruising Yacht Race. A graduate of Princeton University, he serves as a research intern at the Naval War College in Newport, Rhode Island. He is a New Englander, dividing his time between Ridgefield, CT Boston, MA and Deer Isle, ME. 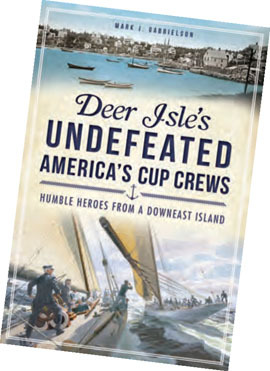 A very worthy addition to every sailor’s library, Deer Isle’s Undefeated America’s Cup Crews is available at local bookstores and online at Historypress.net. E-book editions are available at Amazon, Barnes & Noble, Apple iBookstore, Google eBookstore, and OverDrive.